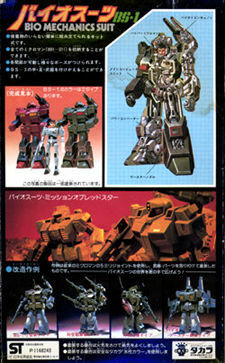 Front and back box art for the Real Microman Bio Mechanics Suit 01. This particular one is greenish brown in color. As you can guess, this is a large departure from the original Microman, and even from the Transformer-like post-80's Microman pieces. This is pretty much a Mecha, and a nice one at that. One thing you can't tell from the box art is that this is a snap-together model kit! Even the figure, shown at bottom left on the front of the box, is a snap-together guy! This kit was meant to be put together and painted. 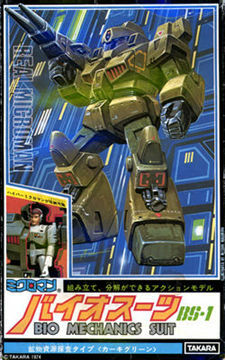 The box art itself is quite nice but has little connection to previous Microman box art. This is pretty much a signature of the 1980s, both for Takara and for toys in general. Had Microman continued as Microman, it's no doubt that this is one of the veins Takara would have followed. This is also one of the last Microman pieces released.